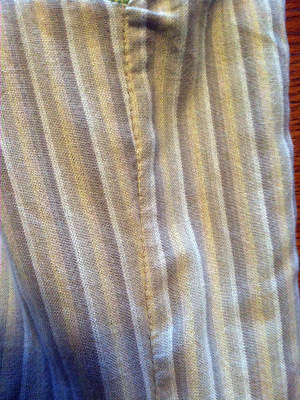 First of all, here's a picture of what I was talking about in the last post, where the collar is sewn into the shoulder seam. This reduces additional bulk in the back, and keeps the collar from pressing against the back of your neck from the weight of the coat. A little thing, but remember that in Victorian times the coat was never taken off, so it doesn't matter what the back of your waistcoat looked like. 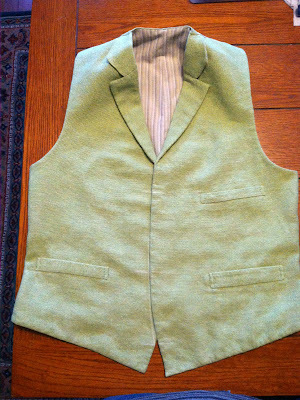 Now some pictures of the waistcoat at this stage. All it needs are buttonholes and buttons. And maybe a back adjustment strap. I was trying to make it fit well enough to not need a strap and buckle, but I think it will work better with it. Here you can see some chalk marks I drew to make sure I line everything up correctly when putting on the buttons. The back. I really wanted to make this of the same material as the lining, but as I bought the end of a roll of fabric for the lining I didn't quite have enough. I tried to make it work, even with the stripes running horizontally, but it just wasn't going to happen. The lining. You can see pleats at the front shoulders in the lining to help keep it from pulling. Detail of the felling where the lining meets the front facings. 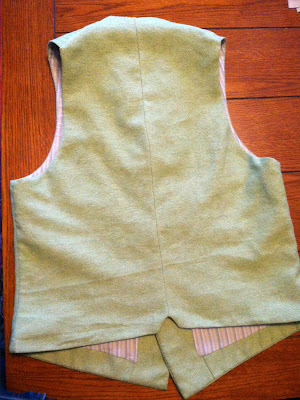 And a detail of where the back lining meets the front. 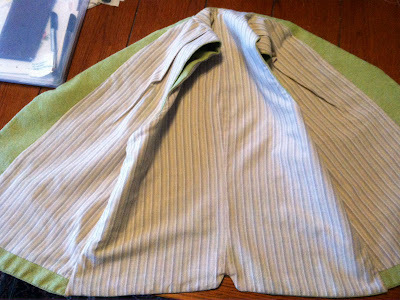 Remember that the front pieces were already lined before I added the back, so the back lining is felled onto the front lining. I could have just made simple buttons, but I figured that a little extra something was worth it. I decided to do a very simple embroidery - just a few crossed lines tied together where they all cross. 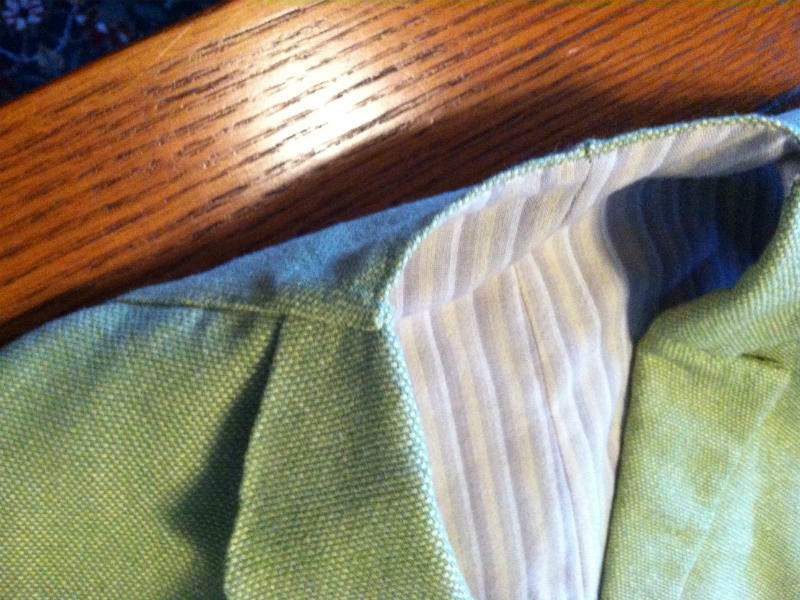 I did a circle of stay stitching around the edge of the button because this fabric frays very easily. Without the stitching, the fabric would just all fall apart at the back where I stitched it over the button molds. A completed button. I sewed a thread shank onto the back of this one, but I'm not sure if I want to keep that, or simply sew the buttons directly onto the waistcoat. 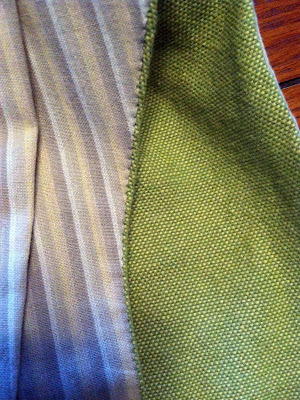 We'll see how this one works, or if it stands too far off the fabric. I keep meaning to ask if you have one of these nifty tools. Not a "must have" but definitely makes figuring out the spacing of buttonholes, corset holes, etc much easier! I just figure out where the top and bottom holes will be, then measure that and divide by the total number of buttons -1 (i.e. for this waistcoat, there are six buttons. The distance between the top and bottom buttons is 11". 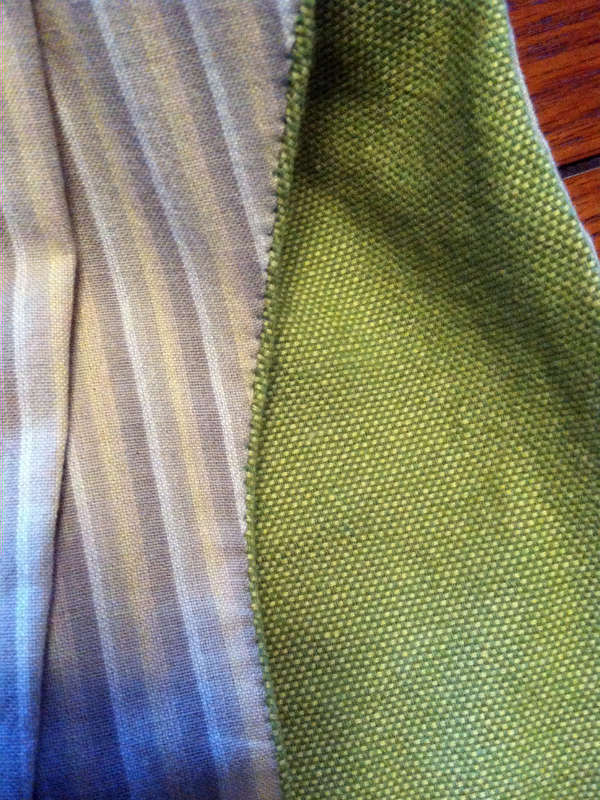 11/5=2.2 so the space between buttonholes is 2.2"). Not too difficult to figure out, though the guide you pointed out keeps everything in a nice straight line. This is looking great. I just found your blog via MPB this morning. So glad I did.